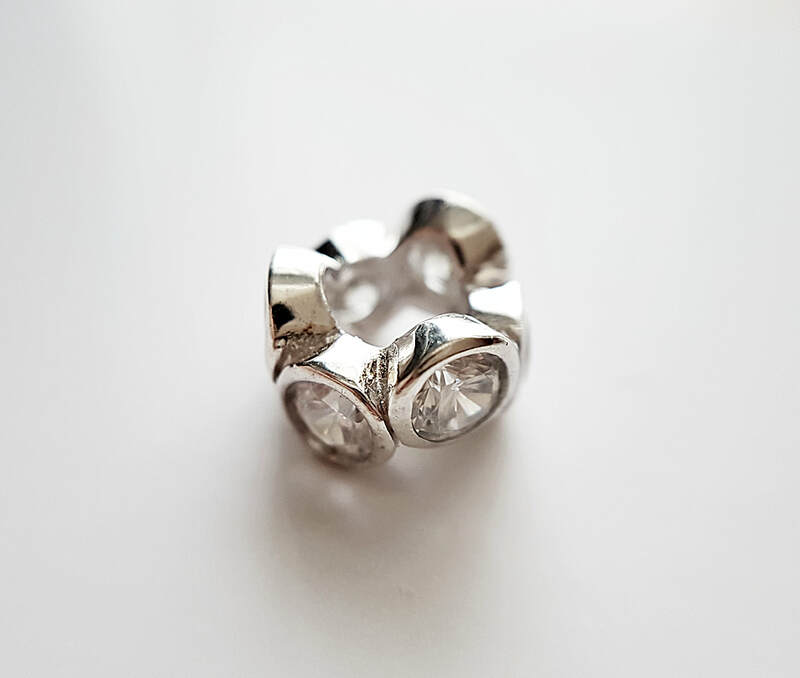 This gorgeous Solid Sterling Silver and clear crystal large hole charm bead will fit most of the popular European Bracelet Chains. Lovely sized crystals that sparkle well. 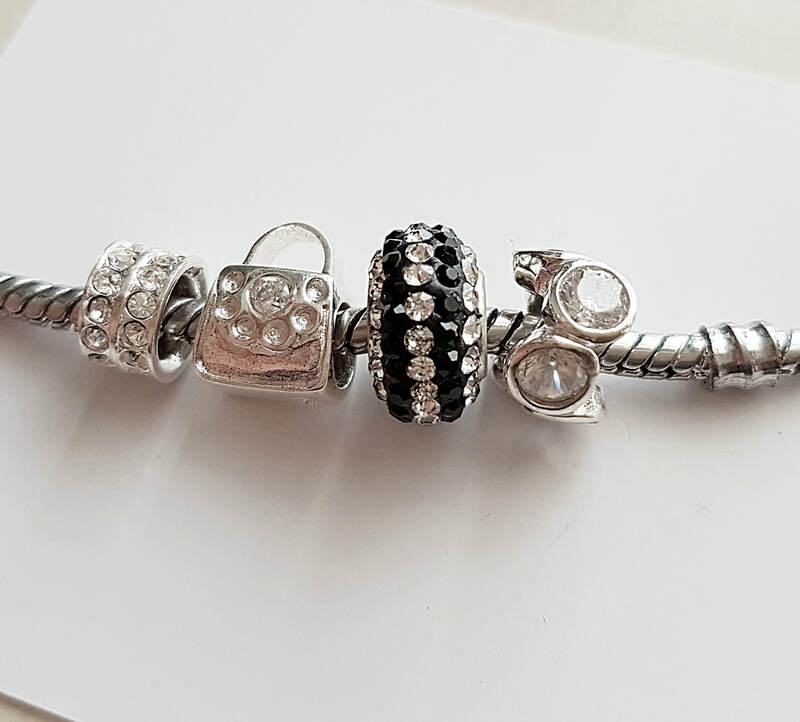 Bottom left corner shows how it looks on a "Pandora Style" bracelet. 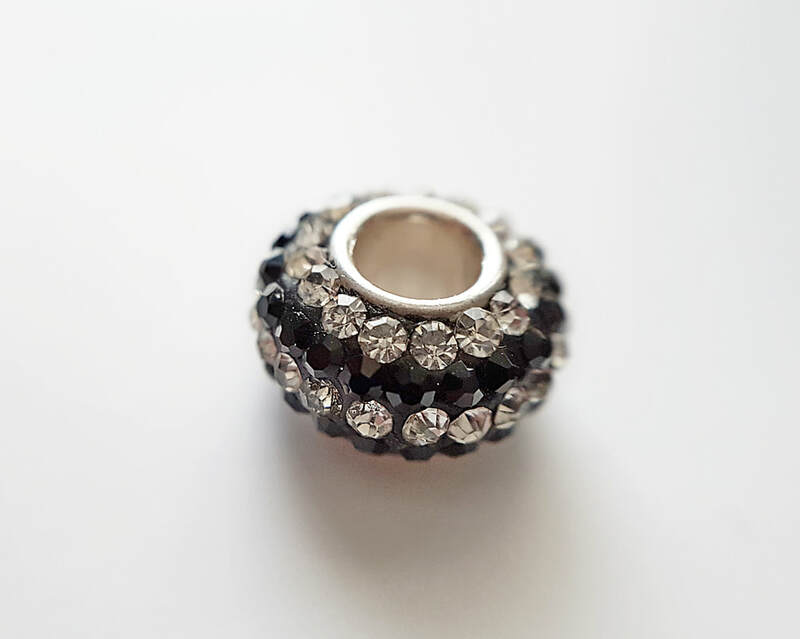 This gorgeous Solid Sterling Silver and multi crystal large hole charm bead will fit most of the popular European Bracelet Chains. Crystals sparkle well. 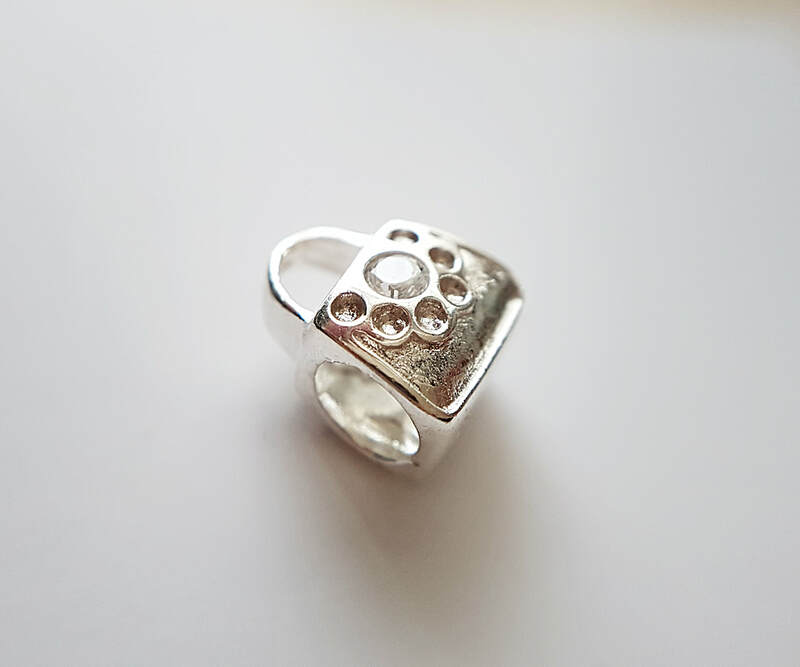 See the photo above with the Sterling Charm #1 to see how it looks on a "Pandora Style" bracelet among other beads. 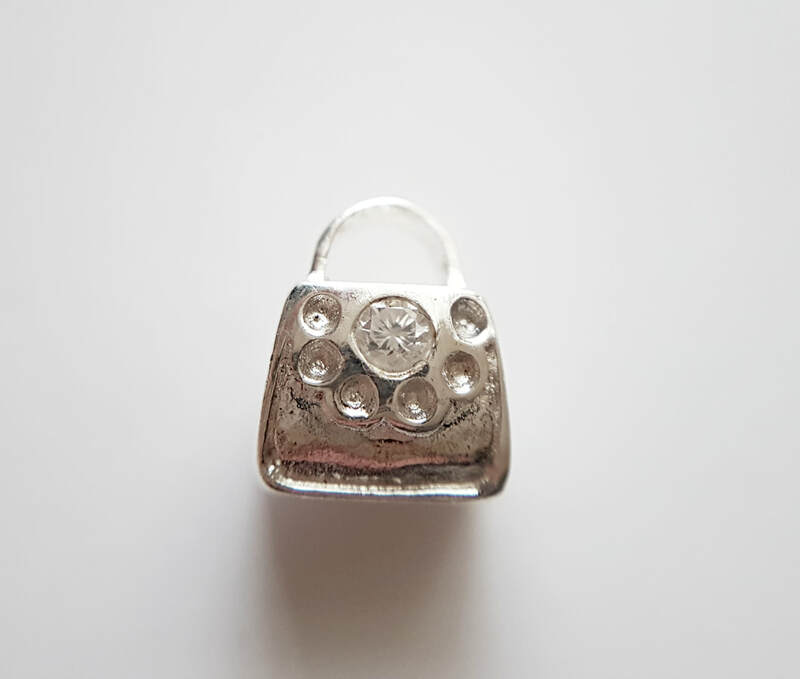 This gorgeous Solid Sterling Silver and crystal large hole charm bead will fit most of the popular European Bracelet Chains. A Crystal & detailing are on both sides. 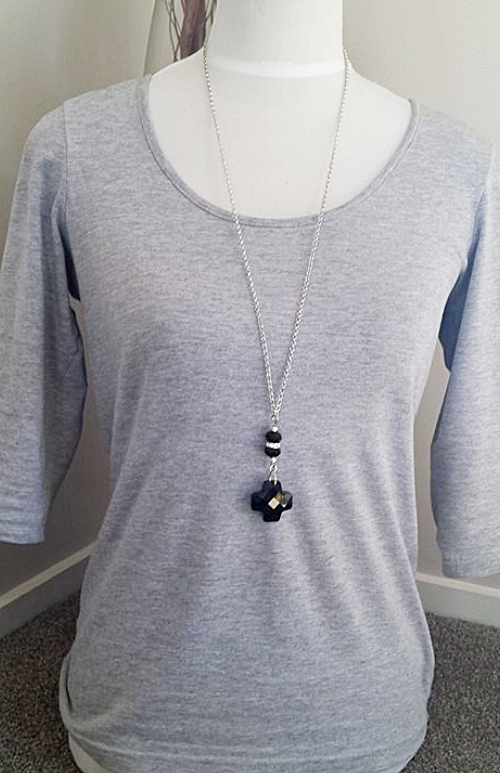 See the photo above with the Sterling Charm #1 to see how it looks on a "Pandora Style" bracelet among other beads. 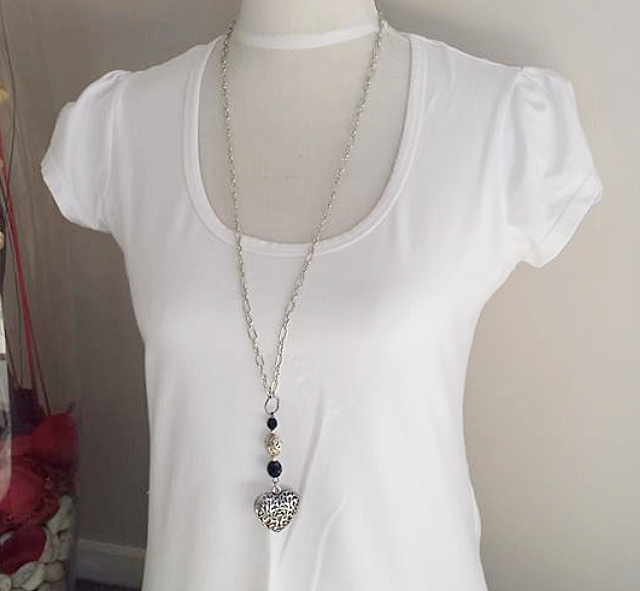 This is a beautiful Pave crystal Ball Pendant AND matching Earrings Set is at an amazing clearance sale price. 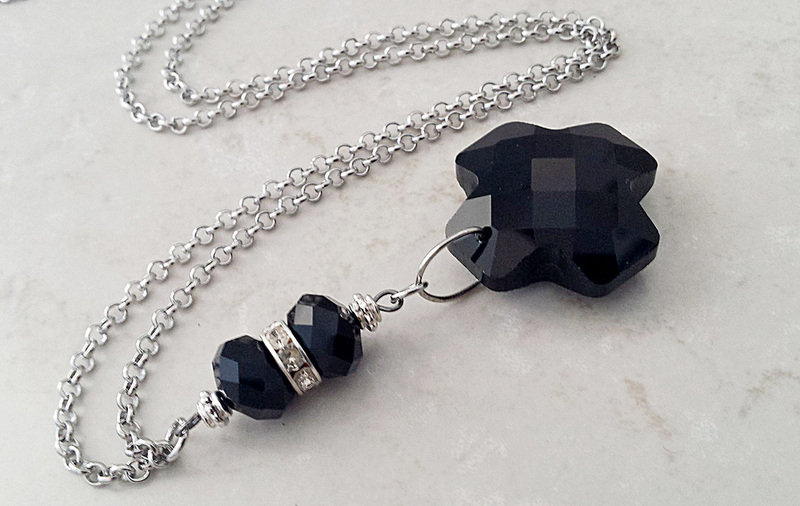 Due to the many wee faceted crystals set into a 10mm black cured clay balls, the sparkle is just gorgeous. A lovely size for any occasion. The pendant comes with a lovely fine flexible silver tone snake chain but can easily be slipped off and put on your own favourite chain. 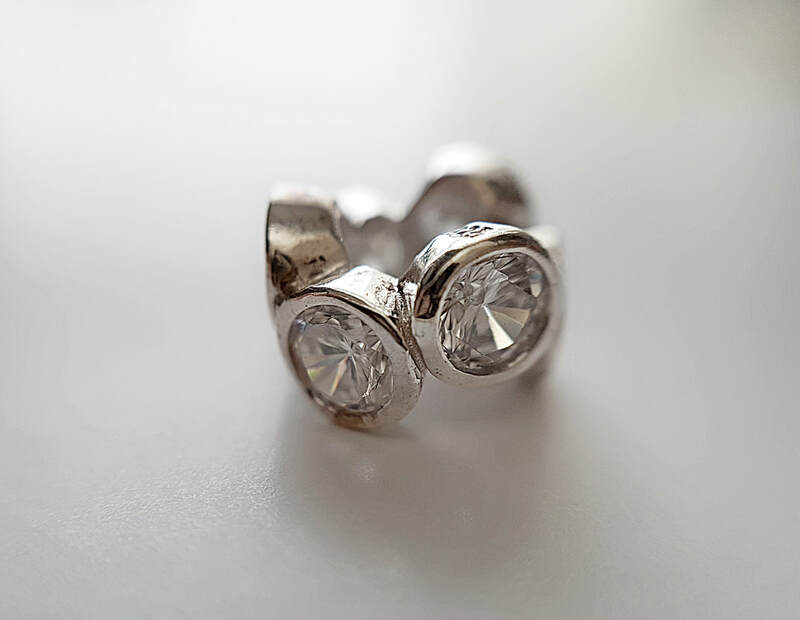 The gorgeous matching stud Earrings come with Butterfly clips. 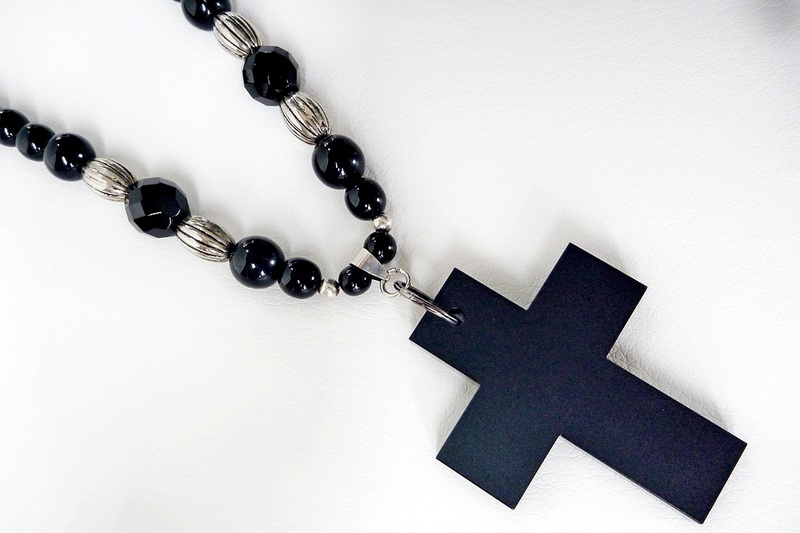 This gorgeous 5.5cm x 4cm matte black resin cross is strung with beautiful smooth black crystal glass beads, Textured silver beads and 2 stunning faceted Czech fire-polished glass beads. 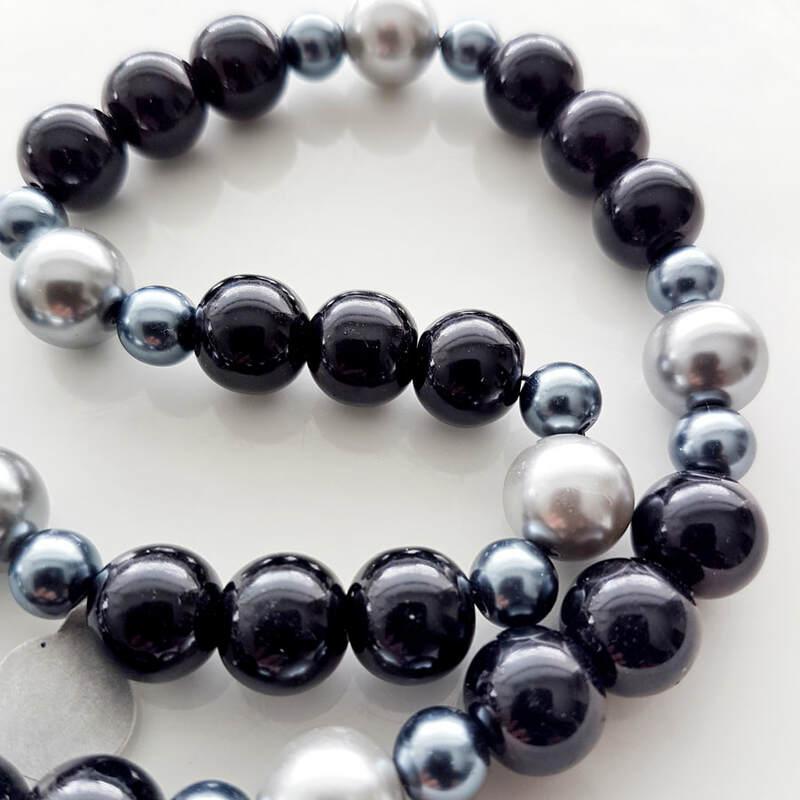 Please try to avoid letting these gorgeous quality beads come in contact with perfume or lotions as it can dull their stunning luster over time. 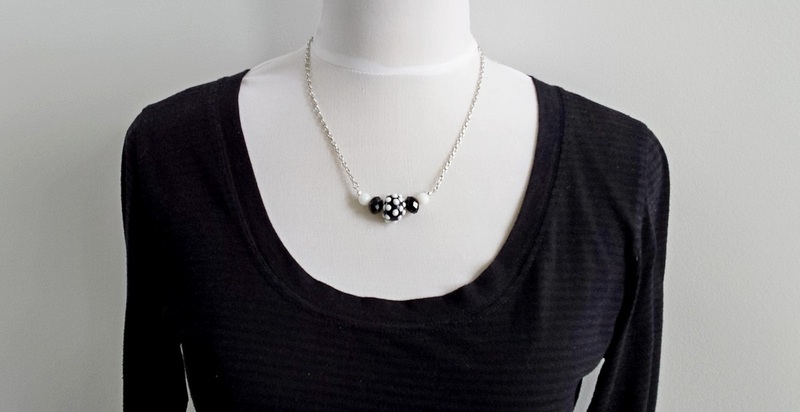 This is a gorgeous collection of quality glass pearl beads on black stretchy cord. No fussy clasps to open or fall around to the front. A nice length to sit above neck lines. 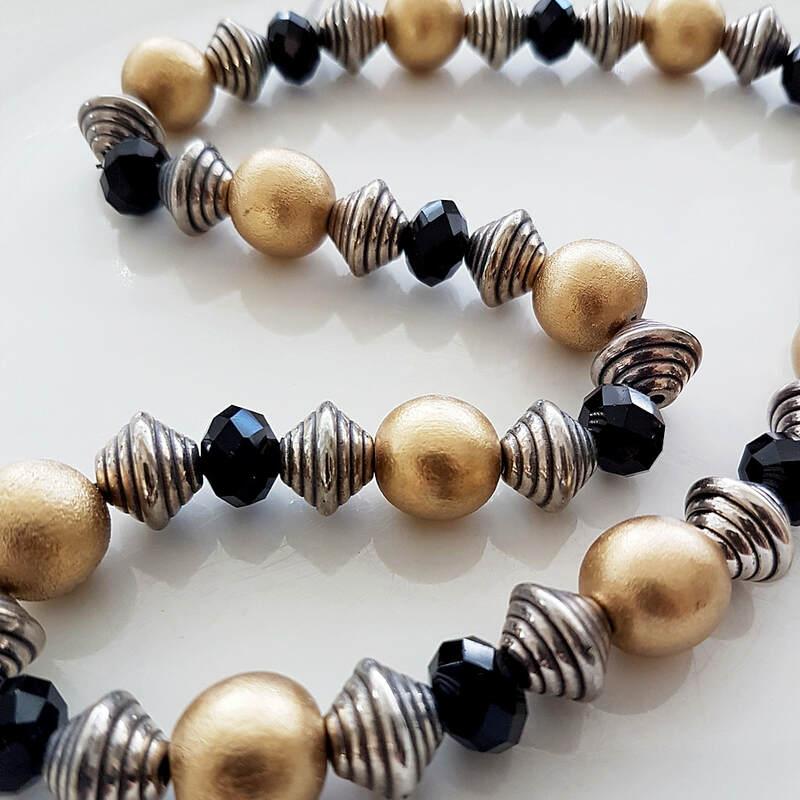 This is a gorgeous collection of quality faceted glass, funky acrylic and metallic gold wooden beads on black stretchy cord. No fussy clasps to open or fall around to the front. A nice length to sit above neck lines. 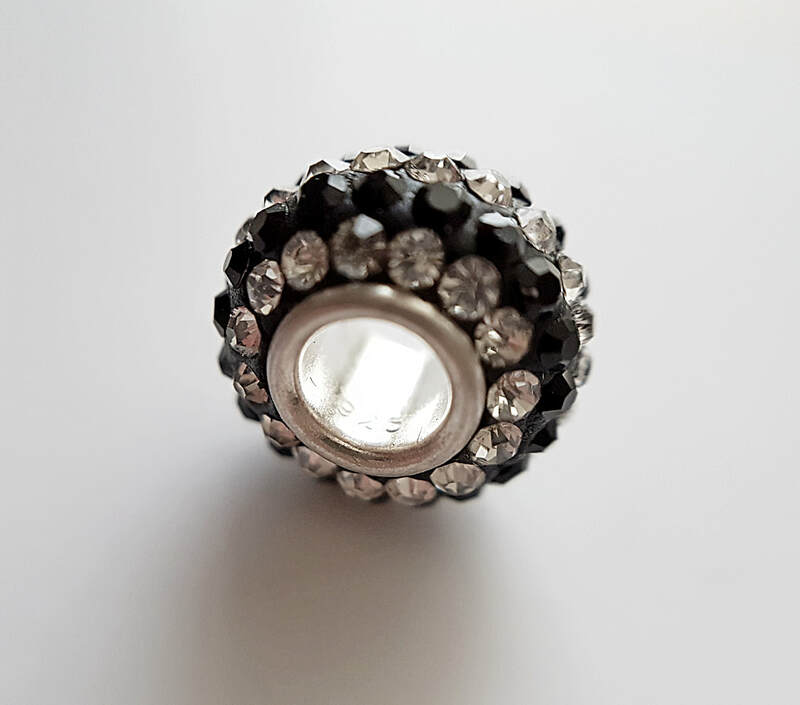 Please try to avoid letting these gorgeous quality beads come in contact with perfume or lotions as it can dull their lovely finish over time. 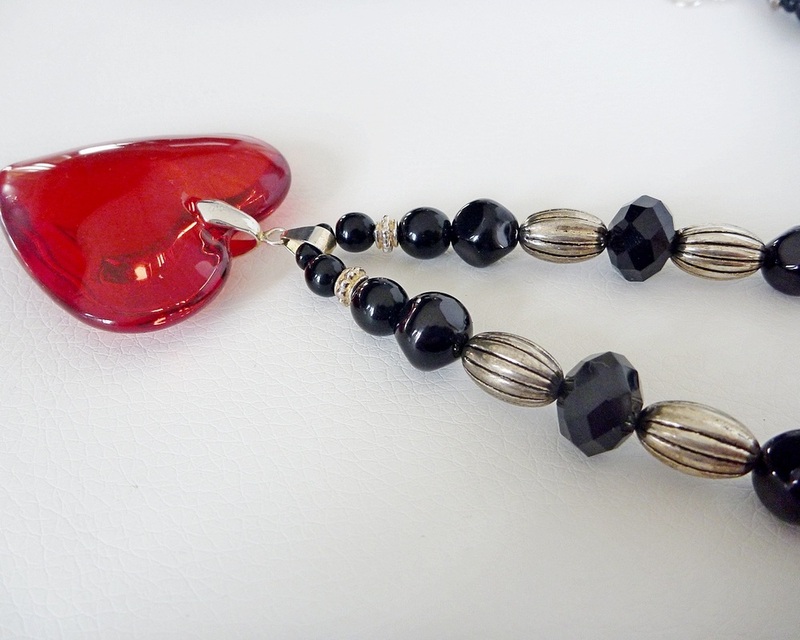 This is a gorgeous collection of quality glossy glass and handmade lampwork glass beads on black stretchy cord. No fussy clasps to open or fall around to the front. A nice length to sit above neck lines. 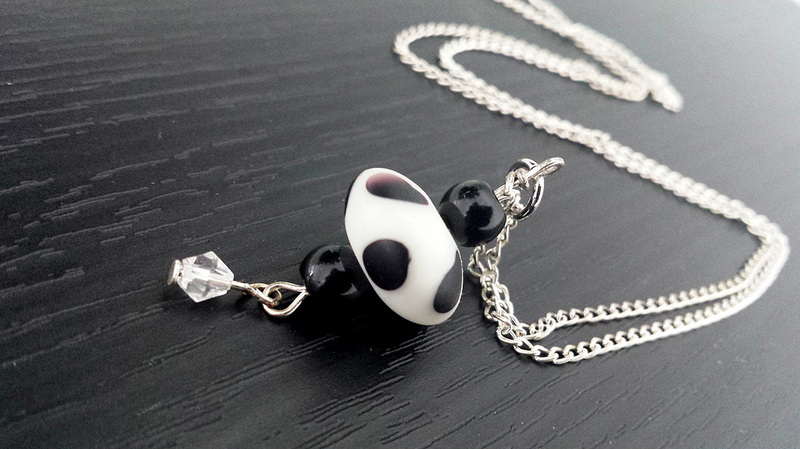 A funky wee combination of quality lampwork and plain glass beads stacked as a drop pendant. 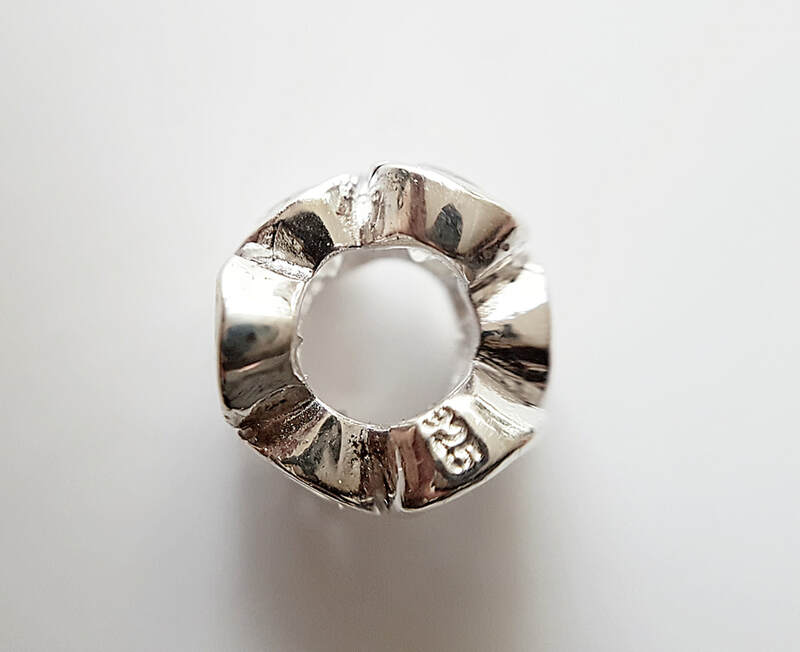 The total drop from the top of the jump ring is about 3.5cm. Strung on approx 46cm-52cm of cable chain including the extension part. 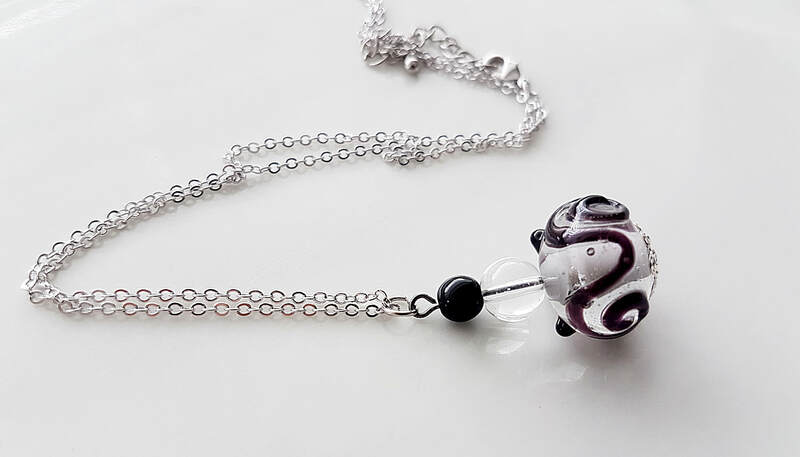 A funky wee combination of quality lampwork and plain glass beads stacked as a drop pendant. The total drop from the top of the jump ring is about 3cm. Strung on approx 46cm-52cm of cable chain including the extension part. 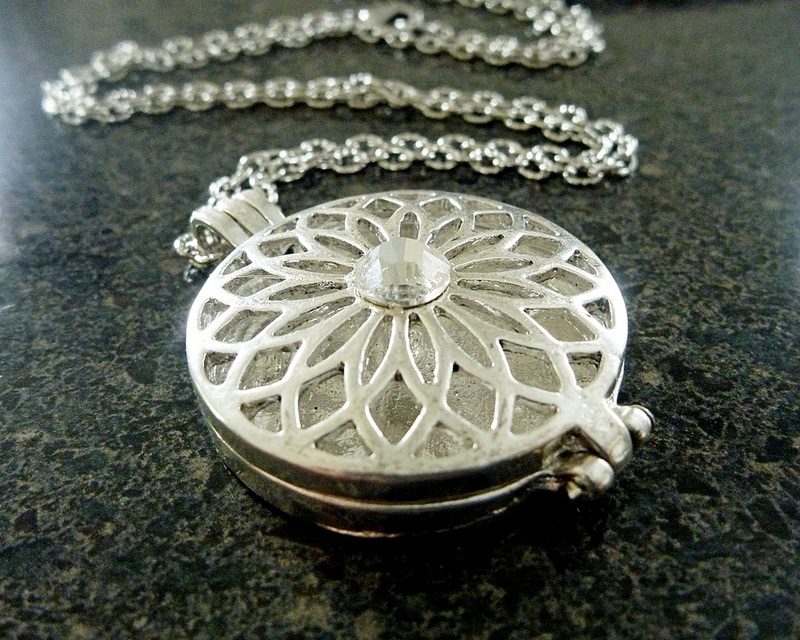 This 33mm "Prayer box" style locket is lead and nickel free with an antiqued silver finish. 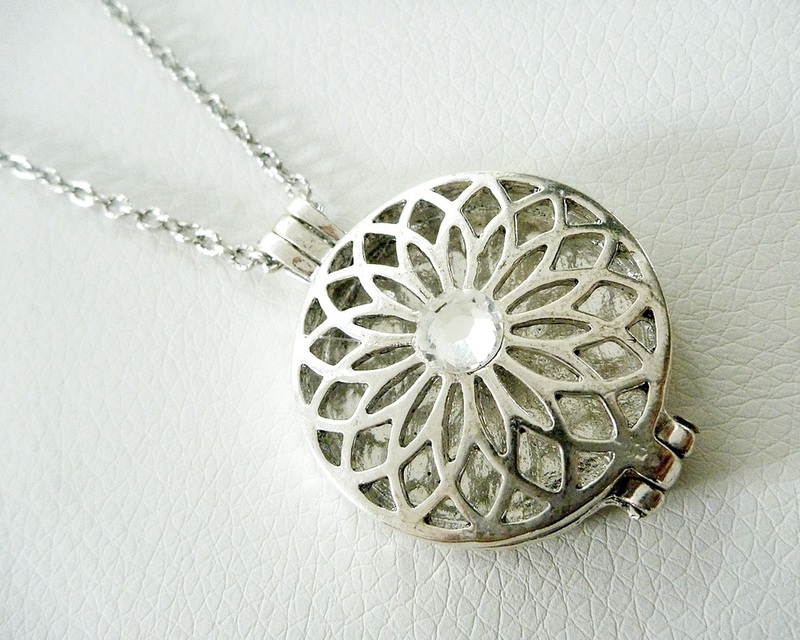 A gorgeous crystal sits central in the filigree design on the front. The cable chain is about 60cm long. Contact me or leave instruction at checkout if you would like the length altered at no extra cost. I can swap to a coloured crystal too if preferred - just ask first. 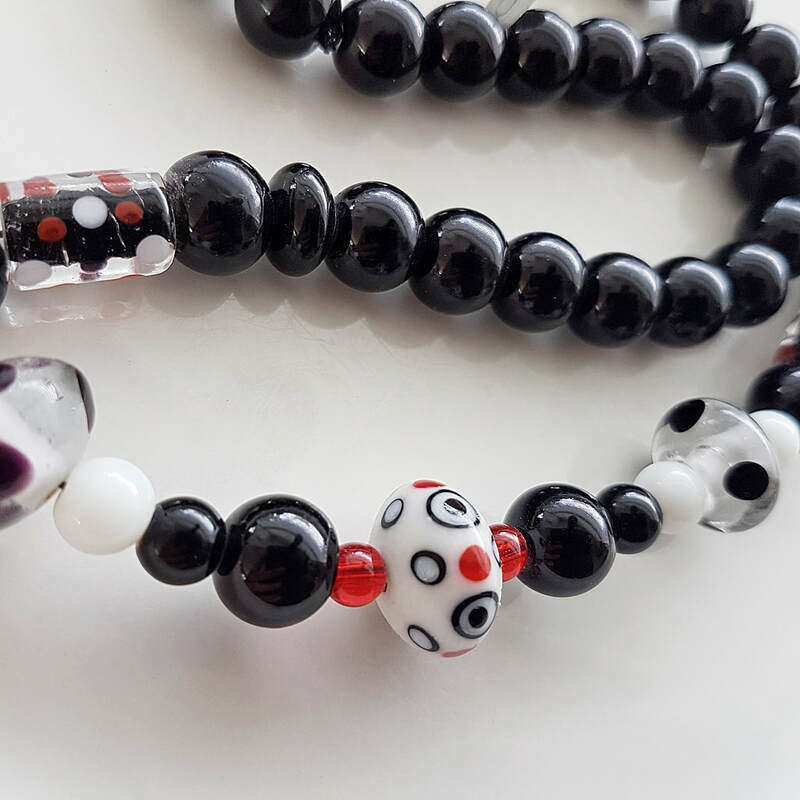 A funky combination of Handmade Lampwork Glass and quality crystal glass beads in classic black & white. 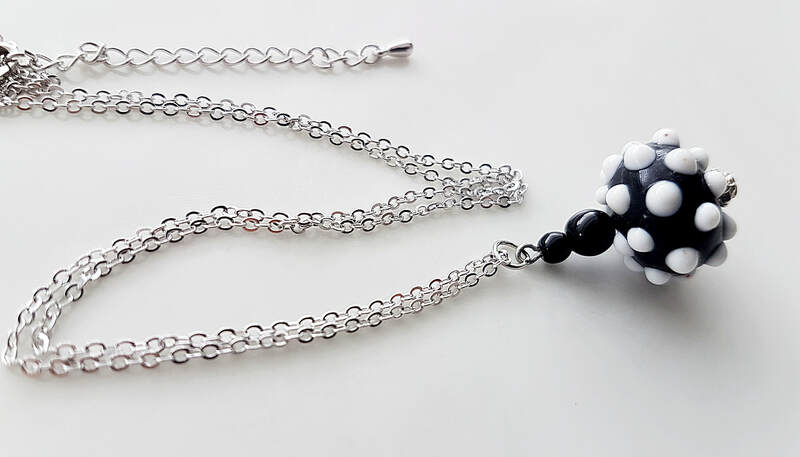 The total length of the necklace including the beads and chain is about 46cm and will sit as shown on an average sized person. I can adjust the length on request. Needs to be treated with care. 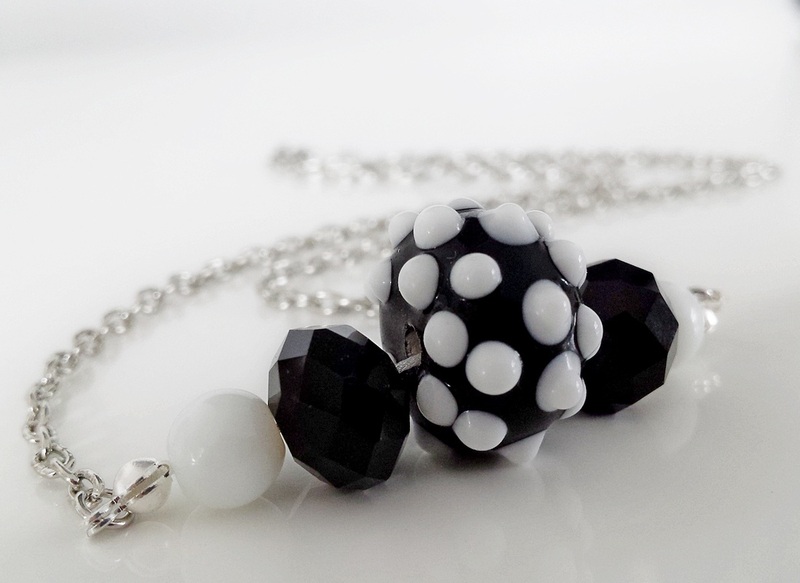 A funky combination of Handmade Lampwork Glass and crystal glass beads in classic black & white with a touch of colour. 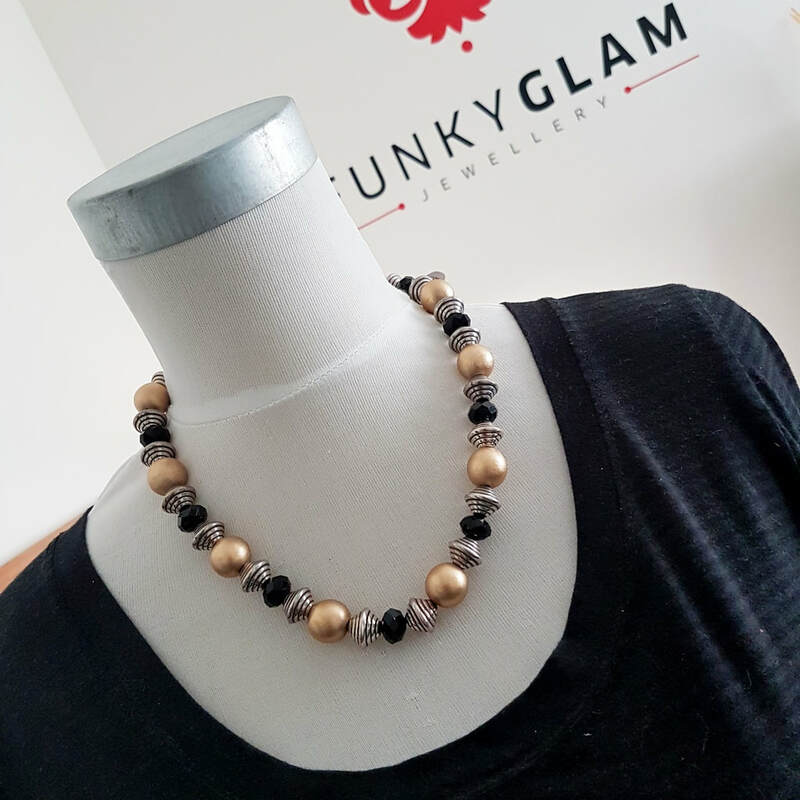 The total length of the necklace including the beads and chain is about 52cm and will sit as shown on an average sized person. 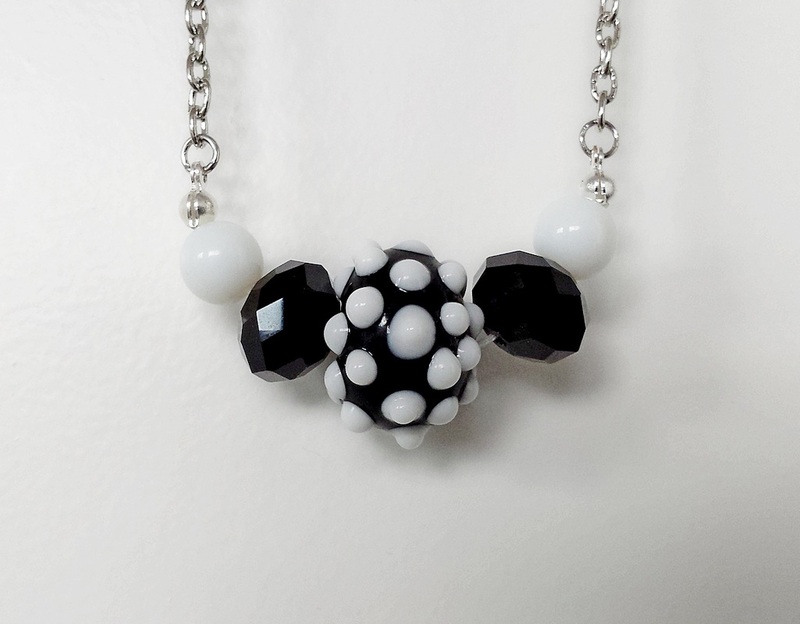 A funky combination of Handmade Lampwork Glass and quality plain glass beads in classic black & white. 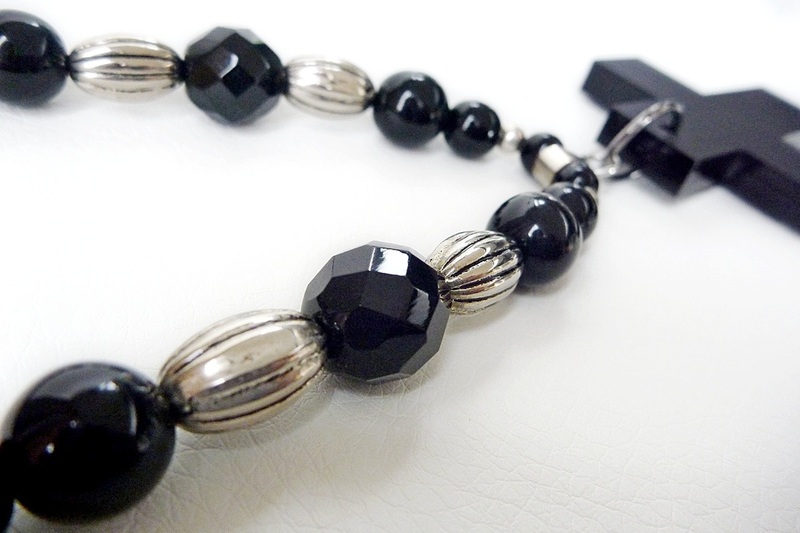 A striking combination of Jet Black Crystal glass, silver beads and a clear crystal rondelle. 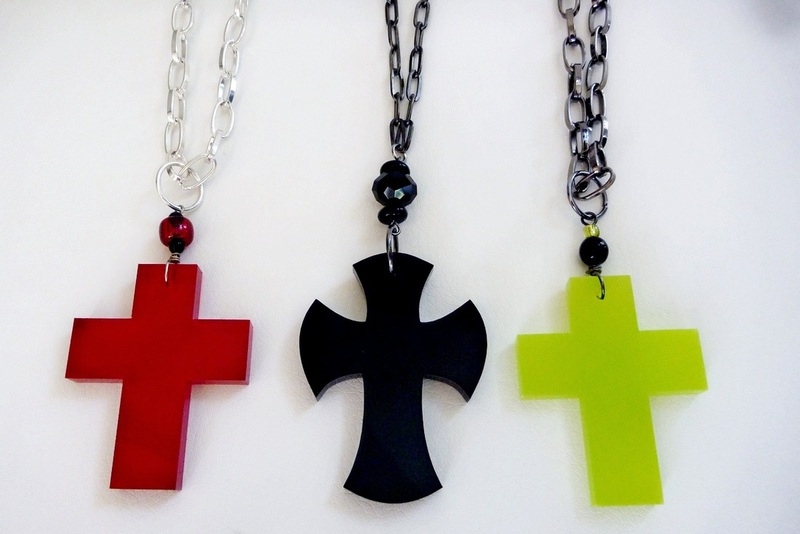 The equal sided crystal cross is about 3cm wide. 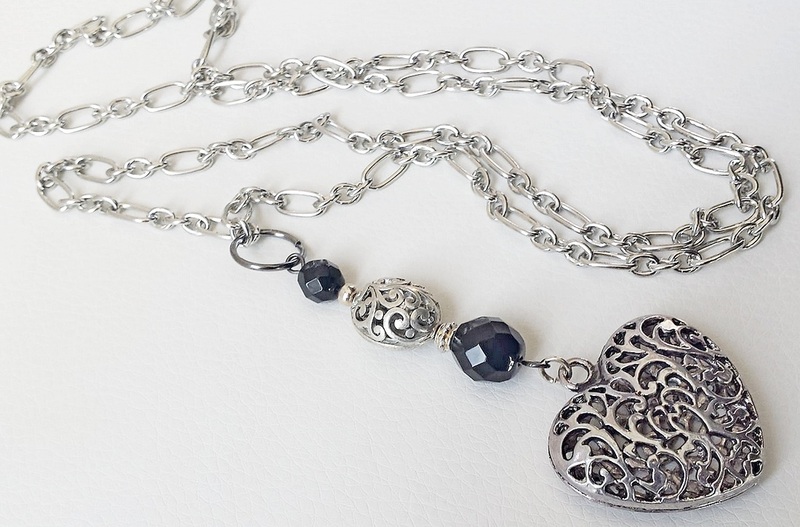 Strung on approx 80cm of lovely dark silver belcher chain. Simple but funky. Contact me or leave instruction at checkout if you want the length altered. Choose your colour option as you add it in your shopping cart. 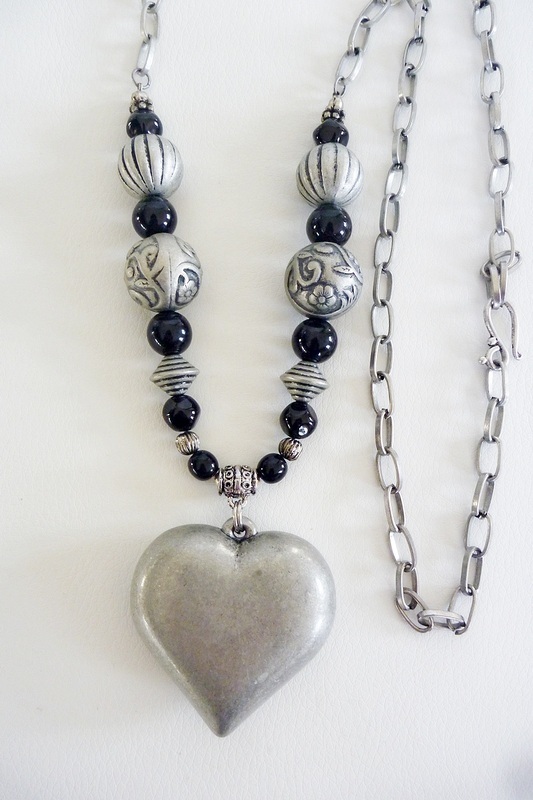 A stunning combination of a large puffed antiqued silver metal heart, stunning textured beads and glossy black glass beads. 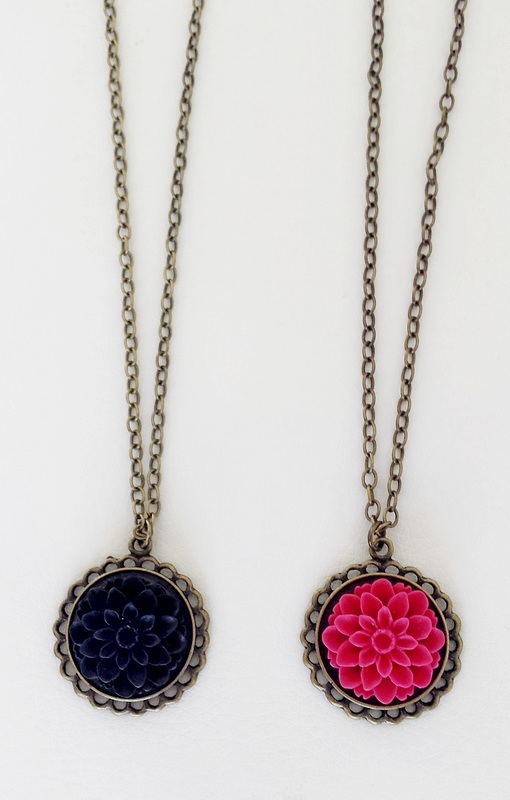 Strung on matching funky chunky antiqued chain. This hangs long and low as shown. I can shorten on request. 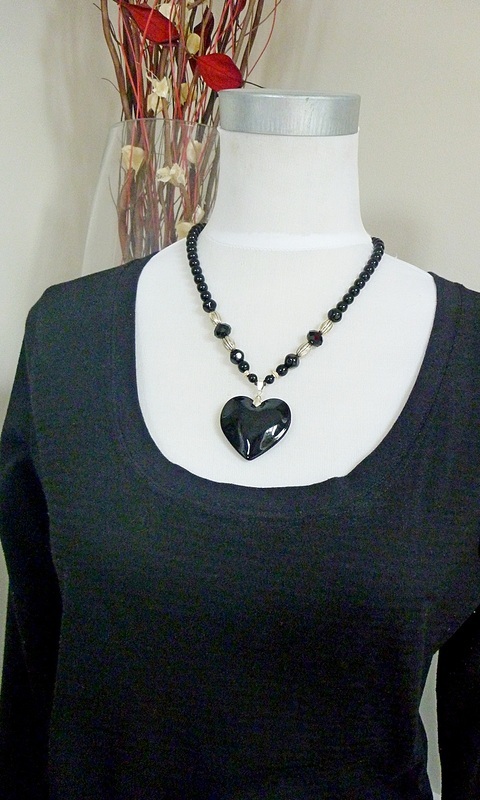 A fabulous statement piece but still very versatile. 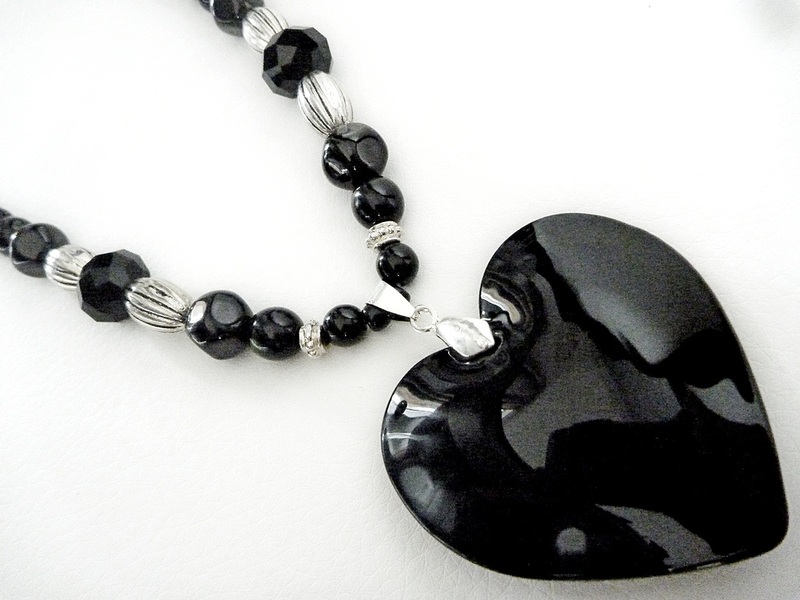 A stunning combination of czech smooth glossy glass beads, gorgeous faceted glass beads, silver textured beads and a gorgeous Jet Black Glass Heart heart. 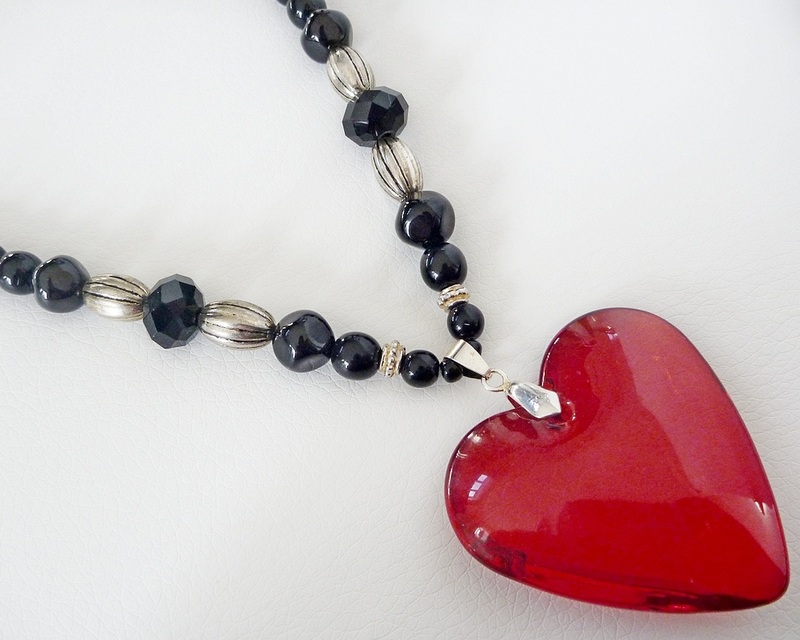 A stunning combination of czech smooth glossy glass beads, gorgeous faceted glass beads, silver textured beads and a gorgeous translucent Red Glass Heart heart. 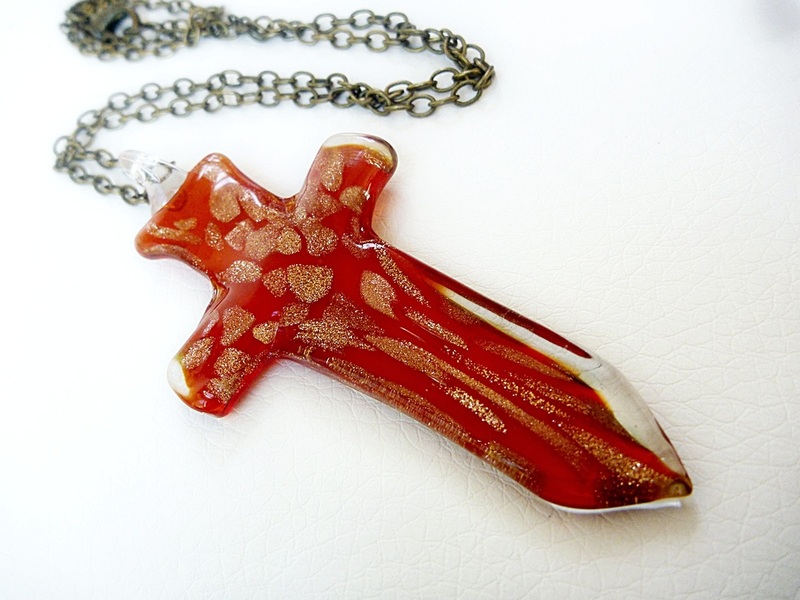 This is a gorgeous translucent red quality resin cross. Equal sided at 5 x 5 cm. I have affixed a lovely black and silver charm and hung it all from a smooth muti stranded neck cord with an extension chain. Can be worn at about 48 - 52cm. 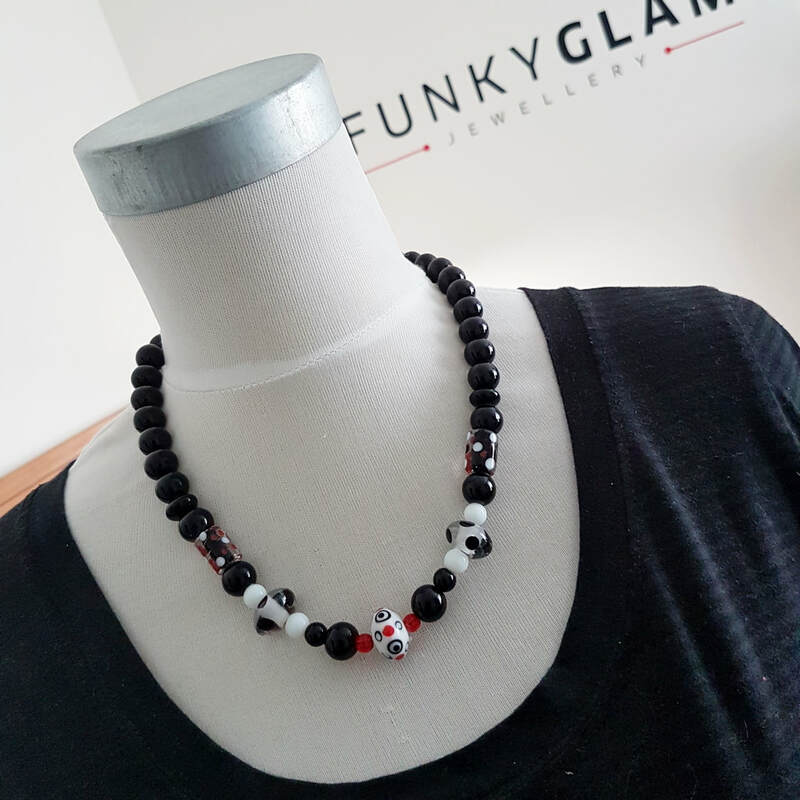 A Funky way to add a blast of colour to any outfit. 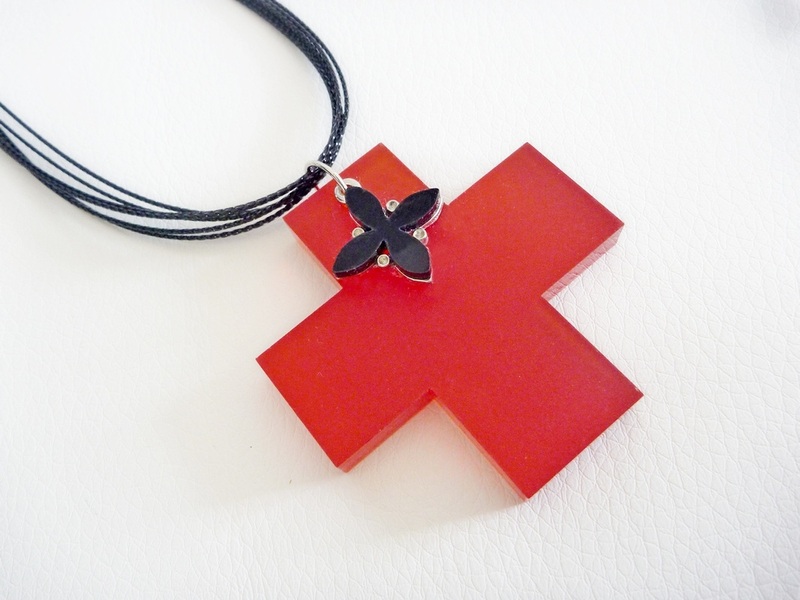 A gorgeous 6cm long Red Resin Gothic Cross with a funky collage of stunning paper and 3 Swarovski crystals. Strung on lovely satin soft cord with translucent red glass beads and slip knots for adjustment. 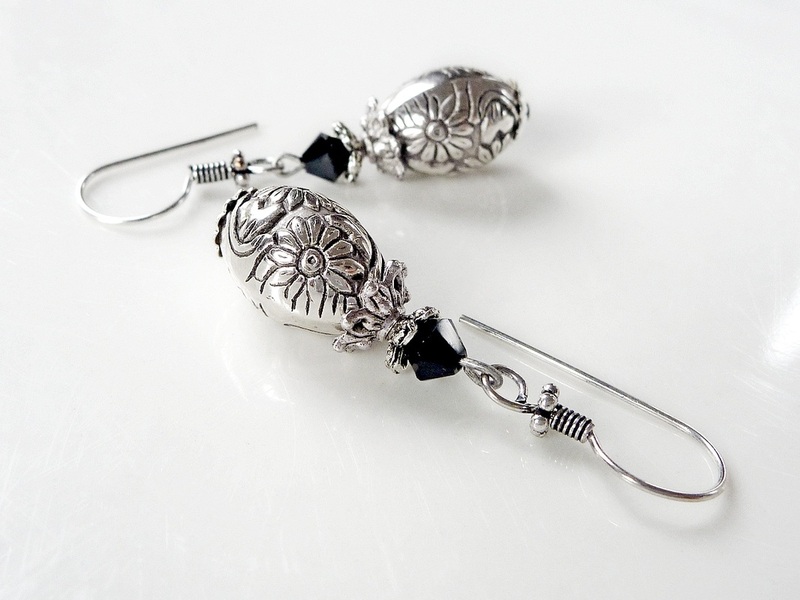 Can be worn up to about 85cm long or much shorter by shifting the beads along. Last one! 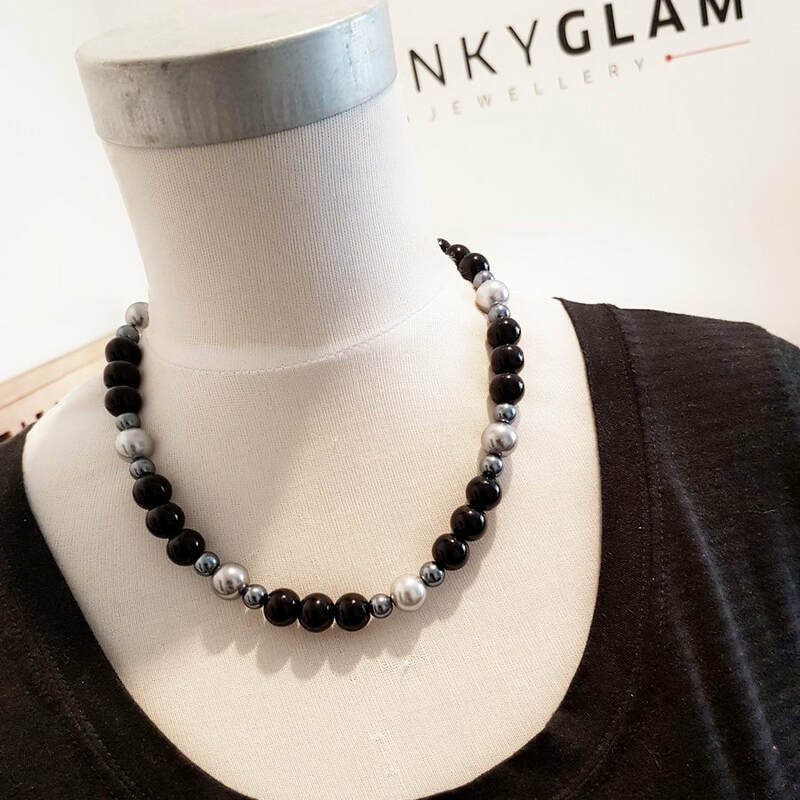 This is an uber funky but feminine combination of silver textured beads and a wee black crystal.The detailing is gorgeous. The total drop from the top of the earwire is about 4.5cm. 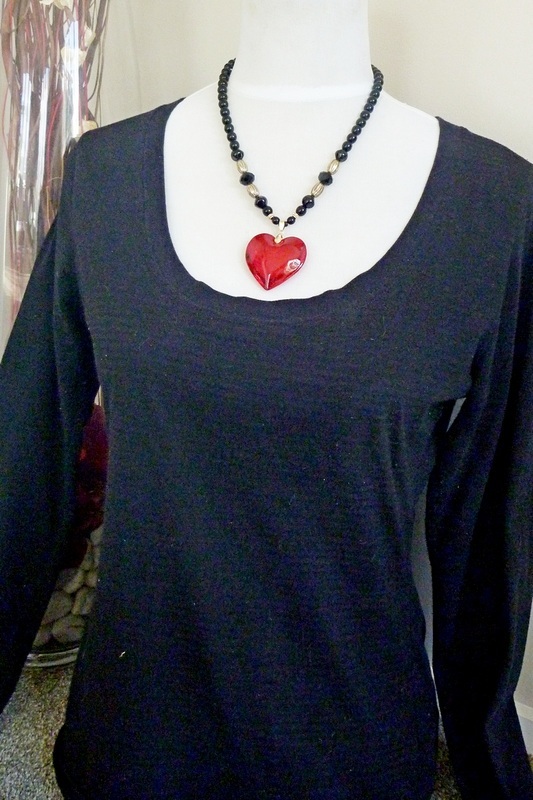 Very light weight to wear and will go with everything from jeans to your favourite little black dress. 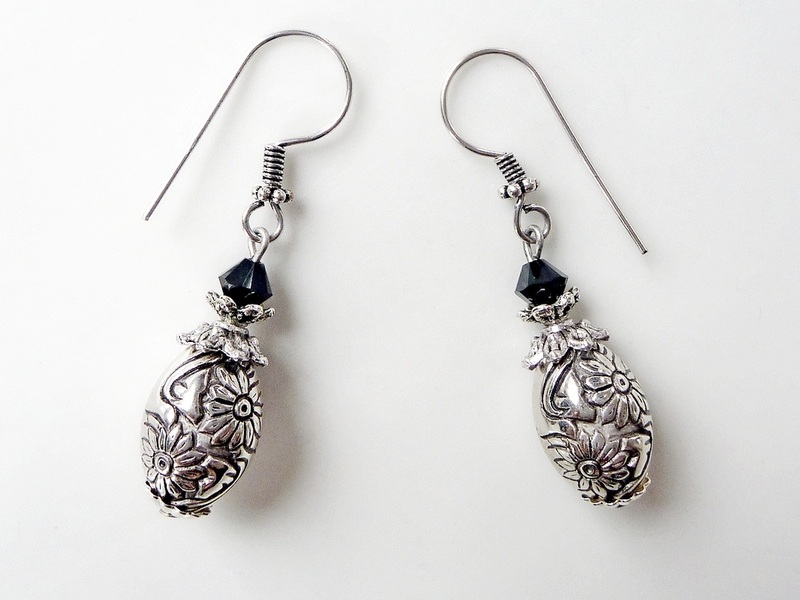 A funky combination of a Tibetan Filigree Silver and jet black faceted crystal glass beads. The Heart is about 3.5cm wide. Strung on about 80cm of chunky cable chain. Hangs long and low. Contact me if you want this altered. This is a gorgeous lampworked glass. 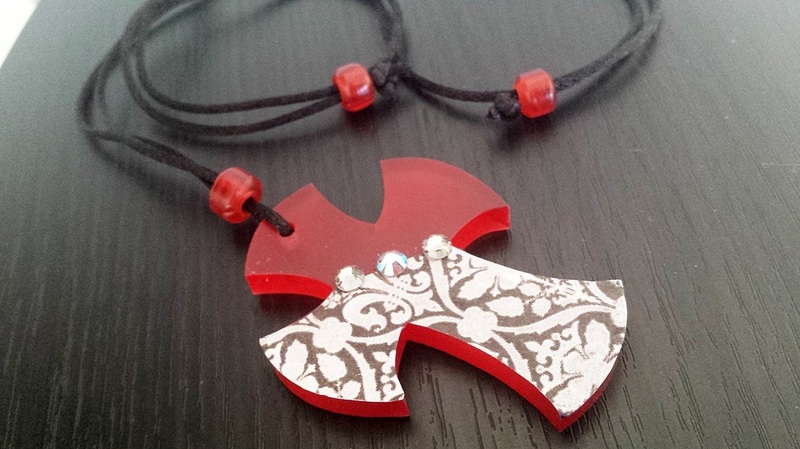 Stunning red with copper-colored foil shimmers. Approx 6.5 cm long. 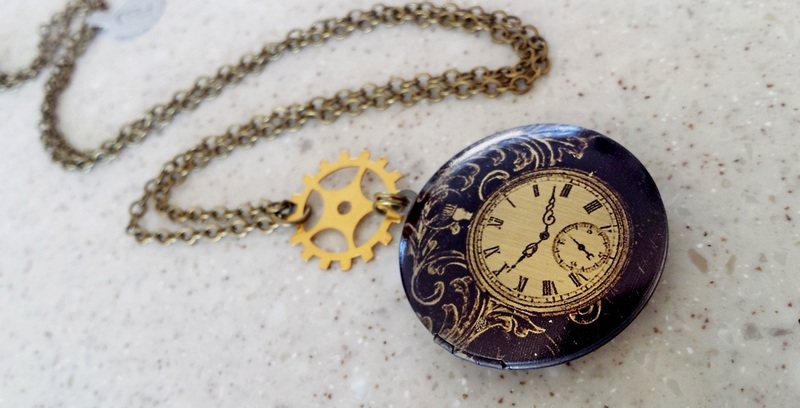 I have strung it on 60cm of lead & nickel free antiqued brass chain. This can easily be removed to swap for your own favourite chain if wanted. This has much more depth and sparkle than the photo shows. 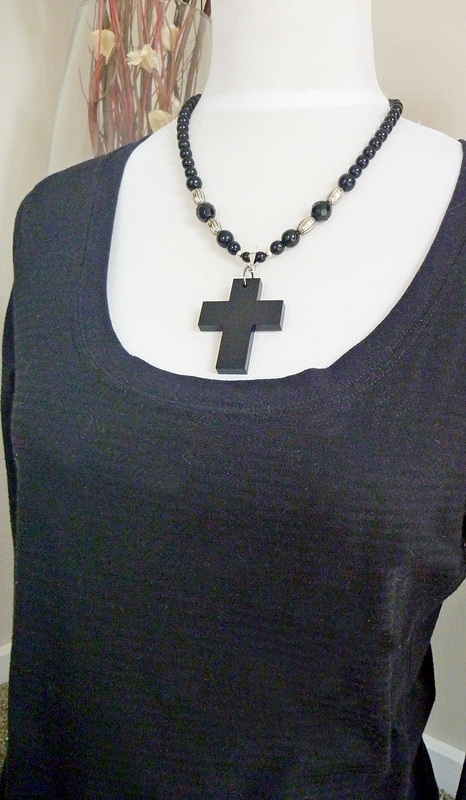 Gorgeous 5.5 - 6cm long cross combined with a glass bead and 70 - 80cm of funky chain. 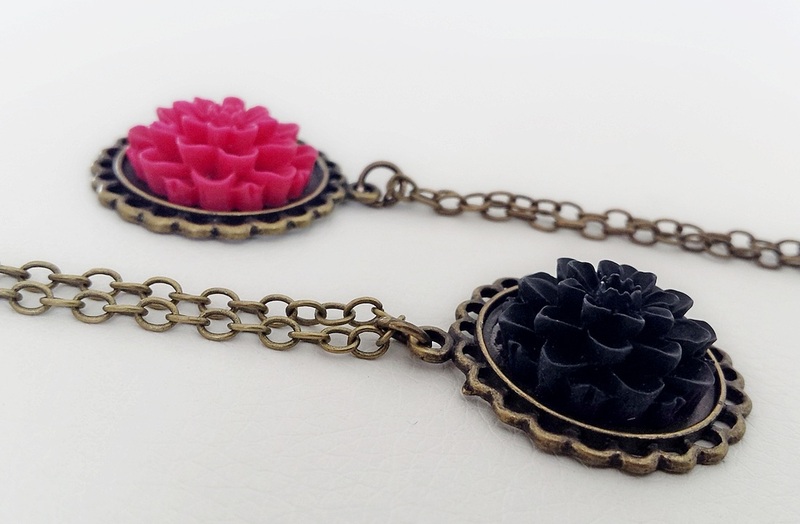 Made from quality laser cut 5mm acrylic. The red and green are slightly translucent, the gothic black is solid and glossy. Chunky stretchy bracelet with a funky mix of glass, acrylic and metal stardust beads. This is a unique one off design. Chunky stretchy bracelet with a funky mix of metal and glass beads. This is a unique one off design. 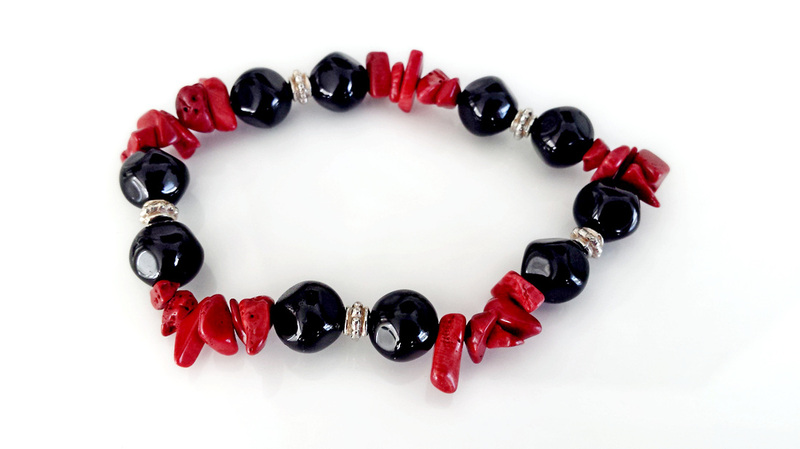 Chunky stretchy bracelet with a funky mix of red dyed coral, faceted black glass and small metal beads. 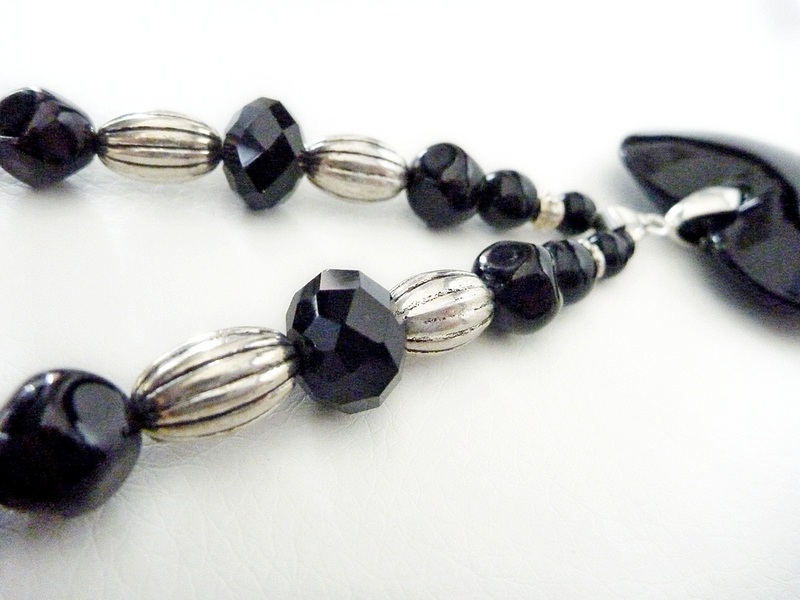 Chunky stretchy bracelet with a funky mix of beautiful faceted glass beads spaced with small silver beads. This is a unique one off design.